With portable air compressors being available for the standard homeowner, every individual is able to inflate their vehicle tires to the required standard whenever they need to without a visit to the gas station. With some models sourcing power from your vehicle battery and some models featuring LCD digital displays along with built-in tire pressure gauges, there are options for every individual and for every need. There are smaller options for those who wish to inflate their vehicle tires along with sports balls and balloons, and there are industrial options favored by the experts which offer you additional features at a higher price. View the Best Portable Air Compressor, Below. How to set up a Portable Air Compressor? How Does a Portable Air Compressor Work? How can I make sure my Portable Air Compressor Runs Efficiently? What Other uses can the Portable Air Compressor Offer? Why are There Different Shapes of Portable Air Compressor? What do the Terms HP and PSI mean in Regards to Portable Air Compressors? Related: Best Portable Compressors for Cars. 50 max PSI 6.0-gallon tank and 2.6 SCFM at 90 PSI. Powerful 2.5 HP 4-Pole motor. 4.2 CFM at 90 PSI. Perfect for inflating a wide range of items. Fast inflation at a rate of 35 L/min. We have tested ten of the best portable air compressors on the market, helping you to decide what type of portable air compressor and what type of budget is right for you. 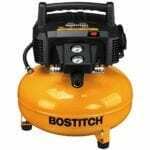 The Bostitch BTFP02012 Oil-Free Compressor features a long-life pump which is easy to use and maintenance free. It features a 150 max PSI 6.0-gallon tank in addition to 2.6 SCFM at 90 PSI. The portable air compressor works at a quiet level of 78.5 dBA, enabling you to work efficiently while ensuring that noise pollution is kept to a minimum. Additional features include a high-efficiency motor which enables the Bostitch BTFP02012 Oil-Free Compressor to start-up even in cold weather. Furthermore, high flow regulators along with couplers are featured to maximize air tool performance. Portable air compressors are generally very noisy machines. The Bostitch BTFP02012 Oil-Free Compressor aims to work at the quietest possible noise level, ensuring that you do not cause too much noise pollution when carrying out tasks around the home. The Makita MAC2400 Big Bore 2.5 HP is an industrial air compressor with a powerful 2.5 HP 4-Pole motor. It is capable of producing 4.2 CFM at 90 PSI, decreasing noise levels of 79 dB, while increasing productivity. Features include copper finned discharge tubing which increases heat dissipation while reducing water within the tank. Furthermore, the durable cast iron cylinder adds longevity to the Makita MAC2400, increasing pump life and ensuring easy maintenance through being removable. The Makita MAC2400 Big Bore 2.5 HP air compressor is a very powerful model which is job site ready and is strong enough to power two nailers. This air compressor is perfect for individuals who are keen to undertake many work tasks and who want a powerful air compressor model in their home. For individuals who want a smaller portable air compressor, the Tcisa 12V DC Portable Air Compressor Pump is a great choice. This Tcisa air compressor will inflate tires, sports balls, balloons, and air cushions at the push of a button. Features include a target value for your desired air pressure, preventing over inflation and creating an auto shut-off. The powerful metal motor provides fast inflation at a rate of 35 L/min and can inflate a tire to 30 PSI in around 2 to 3 minutes. Furthermore, the air compressor features a large LCD digital display and a built-in tire pressure gauge, aiding ease of use for the user. This is a perfect option for individuals who just want to inflate their car tires, sports balls, and balloons without any of the additional features which many of the more expensive air compressors include. The California Air Tools CAT-1P1060S is a lightweight, portable air compressor, weighing only 29.5 lbs. It features ultra quiet noise control at only 56 dB yet offers a 1.0-gallon steel tank, providing a powerful tool for several uses. Furthermore, this air compressor features a peak of 1.2 HP, 1.20 CFM at 90 PSI. In addition, being an oil-free tool, there is less maintenance, and it can be used in cold temperatures. Quiet at only 56 dB. Peak 1.2 HP - 1.20 CFM at 90PSI. This is a great lightweight, yet powerful, option which retails at a very reasonable price. It is also the quietest portable air compressor on our list. The DEWALT DWFP55126 Pancake Compressor provides a high-efficiency motor which offers an effortless start-up even in cold temperatures. Featuring 165 max PSI 6.0-gallon tank along with a 2.6 SCFM at 90 PSI, you additionally receive a quiet noise level of 75.5 dB for ease of use and reduced noise pollution. The air compressor offers a high flow regulator and couplers to maximize the air tool performance. Effortless start-up in cold temperatures. 165 max PSI 6.0-gallon tank. Quiet noise level of 75.5 dB. With the DEWALT DWFP55126 Pancake Compressor, you receive a powerful air compressor at a very reasonable price, offering a quiet level of noise for a strong tool. The VIAIR 400P Portable Compressor is a great tool to take on the road for you, ready to use whenever and wherever you need it. To use, attach the heavy duty battery clamp supplied with the air compressor to the vehicle battery and inflate a 35-inch tire from 0 to 30 PSI in under 5 minutes. The air compressor is 12 volts operated with 150 PSI max working pressure when the engine is running. Furthermore, a deluxe carry bag is included along with an anti-vibration tray to enhance your experience and your ease of use. Use through connecting the clamp to the vehicle battery. You may never know when you will need to inflate your tires. Being on the road, or traveling in remote areas, you may be a long way away from a power source. Therefore, the VIAIR 400P Portable Compressor is a must have tool, being able to source power from the vehicle battery so that you are never without optimum inflation. 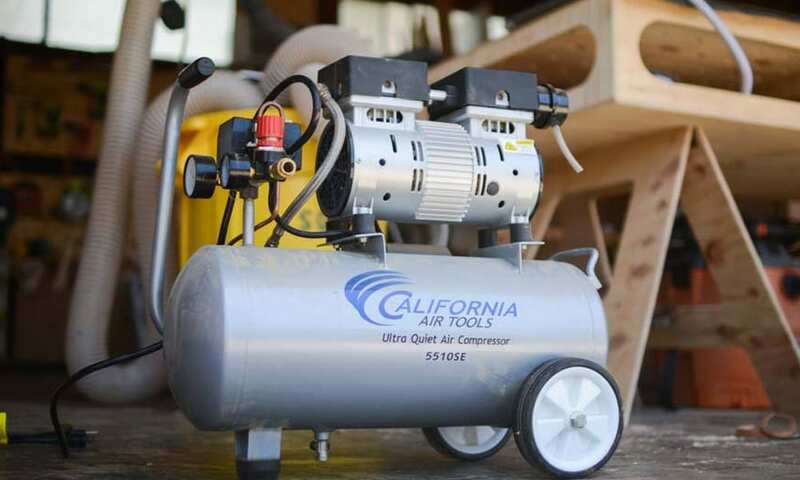 Being marketed as an ultra quiet air compressor, the California Air Tools 8010 is a fantastic tool for individuals who work in well-populated areas and who may want to keep noise pollution to a minimum. Featuring a 1.0 HP motor, the oil-free Dual Piston Pump System offers durability along with a high performance every time. This air compressor is a lightweight tool, despite having an 8.0-gallon steel air tank. With a maximum pressure of 120 PSI, noise levels are kept low with only 60 dB in use. 60 dB for quiet working. At a respectable price, you are receiving a strong air compressor with a very low level of noise pollution. The air compressor is also extremely lightweight which is always a bonus. The Excell U256PPE Pancake Air Compressor is an oil-free and maintenance free universal pump and motor, featuring a 1.5 HP 6.0-gallon air compressor. Providing low voltage start-up capability of 64 volts, this tool may be perfect for individuals with deficient power supplies. This air compressor offers a strong start-up even amongst cold temperatures, delivering 2.8 CFM at 90 PSI, with a maximum pressure of 150 PSI. Oil-free and maintenance free universal pump and motor. 1.5 HP 6.0-gallon air compressor. 2.8 CFM at 90 PSI. The Excell U256PPE Pancake Air Compressor is a powerful air compressor at a reasonable price. Featuring a low voltage start-up, this may be perfect for individuals living in rural areas or in an older building with deficient power supplies. The PORTER-CABLE C2002 Oil-Free air compressor offers a 150 PSI maximum tank pressure along with 2.6 SCFM at 90 PSI. Featuring a 6.0-gallon pancake style tank with rubber feet in addition to a water drain valve, the low amp 120-volt motor starts up easily even in cold temperatures. 150 PSI maximum tank pressure. 2.6 SCFM at 90 PSI. Easy start-up in cold temperatures. The PORTER-CABLE C2002 Oil-Free air compressor features a large tank capacity along with a powerful motor and a low amp motor which starts up well in cold weather. The DEWALT DWFP55130 Heavy Duty air compressor features a 3.0 SCFM delivered at 90 PSI pump in addition to a 2.5-gallon tank and 200 maximum PSI. The lightweight tool and compact design with carrying handle aids ease of use and the ability to store effectively. Furthermore, the low 12 amp draw motor provides an easy start-up to inflate all the items you require in no time at all. 3.0 SCFM delivered at 90 PSI pump. 2.5-gallon tank and maximum 200 PSI. Carry handle for ease of use. Low 12 amp draw motor. The design of the DEWALT DWFP55130 Heavy Duty air compressor allows the user to carry the tool with one hand, being lightweight and compact for ease of use and adaptability. You should ensure that all safety precautions are taken and that you are firstly wearing any necessary safety equipment, depending on the task you are carrying out. Always follow the instructions as models and brands will differ in the set-up and usage of the portable air compressor. Although, in general, you should begin by checking the power source; for portable air compressors which use oil as a power source, you should always check the oil level before using. Next, make sure that all other air valves are closed to prevent air leakages and to ensure that the pressure of the compressed air is constant. Always follow the instructions as models and brands will differ in the set-up and usage of the portable air compressor. 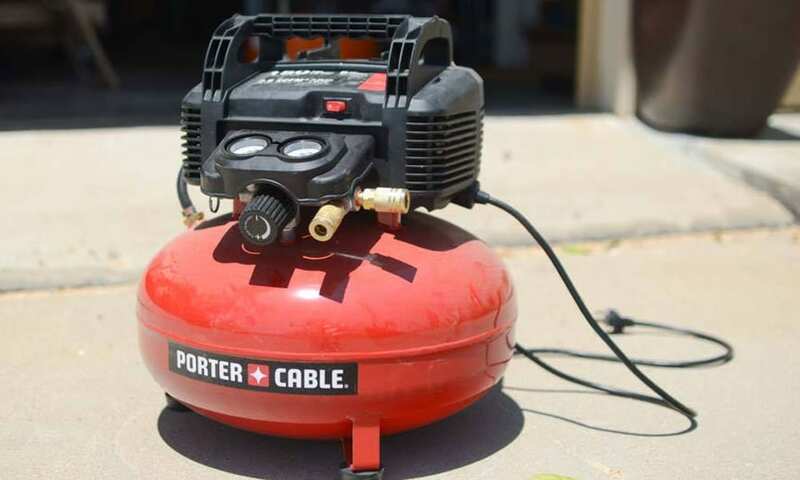 Once you have set up the portable air compressor effectively, turn on the portable air compressor and then connect the compressor hose to the air inlet of the item which you want to inflate. Once you have finished, turn off the portable air compressor and ensure that the power source is securely turned off. The portable air compressor works through a single motor converting the electrical energy from the power source into kinetic energy. ● Inspect the equipment for any oil leaks. ● Check for any air leaks. ● Assess the ability of the compressor, deciding whether it needs to be changed. ● Verify the operating temperature which you consider safe. ● Drain any condensation from air receiver tanks. The main use of the Portable Air Compressor is to inflate vehicle tires, with a secondary use being to inflate sports balls as well as balloons and other inflatables. However, some air compressors offer many other features such as the ability to insert high-pressure air into gas cylinders or providing pressurized air to power pneumatic tools. Portable air compressors come in many different shapes and sizes, depending upon the size of the Air Compressor along with the purpose of that particular Air Compressor, and whether the Air Compressor is more for domestic or industrial use. Different shapes of compressor tanks include horizontal, vertical, pancake or twin tank. HP stands for horsepower and indicates the strength available to the Portable Air Compressor. PSI means Pounds per Square Inch and is a measurement of the air pressure which the compressor generates within the tank. A light duty compressor may possess a 90 PSI which is suitable for domestic use, although a more powerful Air Compressor may have a 150 PSI or above. Regardless of your needs, our list of best portable air compressors has something for everyone. There are lightweight and compact models, air compressors which offer less noise pollution and tools which can be used on the road, a portable air compressor is a vital investment for your home and your vehicle. Ensure to keep your tires in the best possible condition by investing in a multi-purpose tool, helping you to inflate your tires on the go and ensuring that you can gain the best possible performance from your vehicle. With a range of prices available, you could decide to purchase a smaller domestic Air Compressor to suit a low budget yet still powerful enough to inflate tires, balls, and other objects. Alternatively, you may opt for a mid-price Air Compressor which provides a stronger system with additional features, or an ultra-powerful industrial-spec model which can be bought for a much higher price tag. Ensure that you always read the instructions fully. Some air compressors will recommend a ‘break-in’ period which must be completed before the first use to gain the most from your tool. This may require you to run the compressor with the pressure valve open for at least a 15 minute period. You should not use a power extension lead on an air compressor as the lead may be too long for the air compressor to function effectively as they are manufactured to handle a certain lead length. We hope you enjoyed our article on "10 Best Portable Air Compressors in 2019", if so, please share and rate it.